In this richly evocative book, Joan Nathan captures the spirit of Israel today by exploring its multifaceted cuisine. She delves into the histories of the people already settled in this nearly barren land, as well as those who immigrated and helped to quickly transform it into a country bursting with new produce. It is a dramatic and moving saga, interlarded with more than two hundred wonderful recipes that represent all the varied ethnic backgrounds. Every recipe has a story, and through these tales the story of Israel emerges. Nathan shows how a typical Israeli menu today might include Middle Eastern hummus, a European schnitzel (made with native-raised turkey) accompanied by a Turkish eggplant salad and a Persian rice dish, with, perhaps, Jaffa Orange Delight for dessert. On Friday nights she visits with home cooks who may be preparing a traditional Libyan, Moroccan, Italian, or German meal for their families, the Sabbath being the focal point of the week throughout Israel (all her recipes are accordingly kosher). And she takes us to markets overflowing with vegetables, fruits, herbs, and spices. To gather the recipes and the stories, Nathan has been traveling the length and breadth of Israel for many years–to a Syrian Alawite village on the northern border for a vegetarian kubbeh and to Bet She’an for potato burekas; to the Red Sea for farmed sea bream and to the Sea of Galilee for St. Peter’s fish; to Jerusalem’s Bukharan Quarter for Iraqi pita bread baked in a wood-fired clay oven, to the Nahlaot neighborhood for Yemenite fried pancake-like bread, and to a Druse village for paper-thin lavash; to a tiny restaurant in Haifa for Turkish coconut cake and to a wedding at Kibbutz May’ayan Baruch in the upper Galilee for Moroccan sweet couscous; and to many, many other places. All the while, she seeks out biblical connections between ancient herbs and vegetables and their modern counterparts, between Esau’s mess of pottage and today’s popular taboulleh, and she delights us with tales of all she encounters. 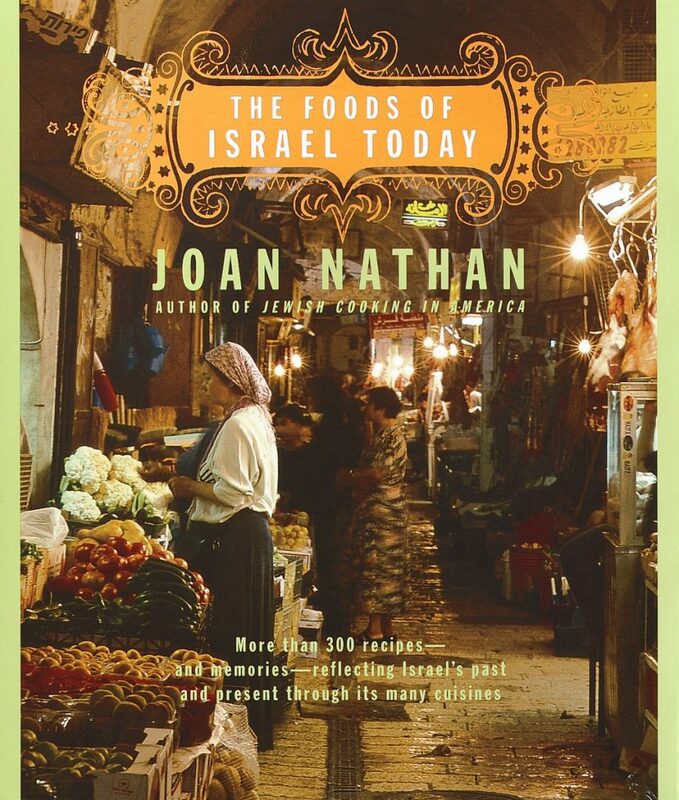 Throughout, Joan Nathan shows us how food in this politically turbulent land can be a way of breaking down barriers between Jews, Moslems, and Christians. Generously illustrated with colorful photographs, this enormously engaging book is one to treasure, not only as a splendid cookbook but also as a unique record of life in Israel. * For signed copies, order from Politics & Prose and indicate that you want a signed copy and any other preferences in the “Order Comments” box at checkout.